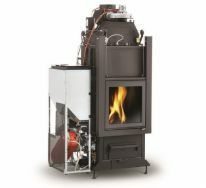 Pellet and wood burning fireplaces function with both types of fuel. The products sold by Fireland are renowned for their high quality and unbeatable prices. Fireplaces with dual function for both pellets and wood offer the possibility of heating your home in an eco-friendly and efficient way. Check out the products in our catalogue and choose the solution which is most suitable for your needs.